Being on time:-Being on time is very important. It not only enables you to spend maximum time with your children but the court understands that these children are your first priority. It is even better if you can manage to be there 15 to 20 minutes before the scheduled time. Be regular: - It is very vital to attend all the visits. Yes, emergency situations can occur but do not miss too many visits at a stretch. In this way, the children will understand that you care for them the most. 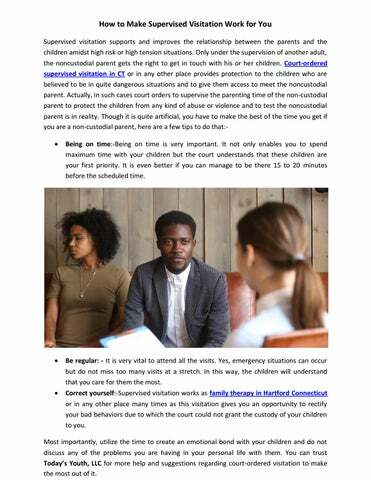 Correct yourself:-Supervised visitation works as family therapy in Hartford Connecticut or in any other place many times as this visitation gives you an opportunity to rectify your bad behaviors due to which the court could not grant the custody of your children to you. Most importantly, utilize the time to create an emotional bond with your children and do not discuss any of the problems you are having in your personal life with them. 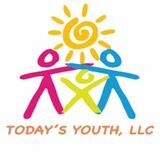 You can trust Today’s Youth, LLC for more help and suggestions regarding court-ordered visitation to make the most out of it.